With thousands of new apps being published in Android Market every week, it’s becoming more and more important to proactively work at breaking through the clutter (hooray for marketing jargon!). One way of improving your app’s visibility in the ecosystem is by deploying well-targeted mobile advertising campaigns and cross-app promotions. However, there’s another time-tested method of fueling the impression-install-ranking cycle: improve the product! The upside to having a higher-quality app is obvious. However, it’s not always clear how to write a so called ‘better app.’ The path to improving app quality isn’t always well-lit. The term ‘quality’, and its close cousins ‘polish’ and ‘fit and finish’ aren’t always well-defined. In this post, we’ll begin to light the path by looking at a couple of key factors in app quality, and furthermore, look at ways of improving your app along these dimensions. Given that pretty much any measure of the ‘success’ of an app involves user-related metrics such as number of downloads, daily actives, retention rates, etc., it’s a good idea to start thinking of your app’s quality as it relates back to your users. The most obvious way to listen to users is by reading and addressing comments on your app in Android Market. Although the comments aren’t always productive or constructive, some will provide valuable insight on aspects of your app that you may not have consciously considered before. It’s important to remember that users have the opportunity to change their ratings and comments about an app as much as they’d like. Now, since Android Market doesn’t currently provide a bidirectional communication medium for developers and their users, you should set up your own support and discussion destination(s). There are some great support tools out there that can put you in touch with your users directly such as Google Groups, Zoho Discussions, getsatisfaction.com and uservoice.com. Once you get set up with such a tool, make sure to fill in the support link in your Android Market listing -- users do click through to these. Another way to better listen to your users is by having a public beta or trusted tester program. It’s crucial to have some amount of real user testing before releasing something in Android Market. Fortunately, you can distribute your apps to users outside of Market via a website; this website can require a login or be publicly accessible — it’s entirely up to you. Take advantage of this opportunity by offering your next planned update to some early adopters, before submitting to Market. You’ll be surprised by how many little, yet impactful, improvements can come out of crowd-sourced, real-user testing. I won’t go into detail about why this is important, because hopefully it’s obvious. And hopefully you’ve been reading this blog and following the best practices outlined in previous posts, so you have a solid idea on how to improve in this arena. One noteworthy and yet relatively underused tool for catching stability issues like crashes, is the UI/Application Exerciser Monkey (aka Monkey). Monkey will send random UI events to your app’s activitie, allowing you to trigger user flows that can uncover stability problems. Also, with the new error reporting features in Android 2.2, users now have the ability to report application crashes to developers. These show up in aggregate in the Android Market developer console. Make sure to read these reports and act on them appropriately. Lastly, keep an external bug and feature request tracker. This will enable your users to engage with the app at a closer level, by following features and bugs that affect them. User frustration with app problems can be effectively managed with diligent issue tracking and communication. Some of the community support tools listed above offer issue tracking features, and if your project is open source, most popular repository hosting sites such as Google Code and GitHub will offer this as well. One sure-fire way to tick off your users is to have a slow UI. Research has shown that speed matters... for any interface, be it desktop, web, or mobile. In fact, the importance of speed is amplified on mobile devices since users often need their information on the go and in a hurry. 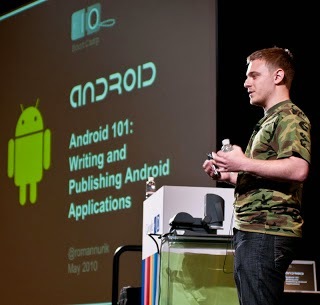 As Brad Fitzpatrick mentioned in his Google I/O 2010 talk, Writing Zippy Android Apps, you can improve your apps’s UI responsiveness by moving long-running operations off the application’s main thread. See the talk for detailed recommendations and debugging tips. One way to improve UI performance is to minimize the complexity of your layouts. If you open up hierarchyviewer and see that your layouts are more than 5 levels deep, it may be time to simplify your layout. Consider refactoring those deeply nested LinearLayouts into RelativeLayout. As Romain Guy pointed out in his World of ListView talk at Google I/O, View objects cost around 1 to 2 KB of memory, so large view hierarchies can be a recipe for disaster, causing frequent VM garbage collection passes which block the main (UI) thread. Lastly, as Tim pointed out in Traceview War Story, tools like traceview and ddms can be your best frends for improving performance by profiling method calls and monitoring VM memory allocations, respectively. I’ll say it again here, listen to your users! Ask a handful of real Android device users (friends, family, etc.) to try out your application and observe them as they interact with it. Look for cases where they get confused, are unsure how to proceed, or are surprised by certain behaviors. Minimize these cases by rethinking some of the interactions in your app, perhaps working in some of the user interface patterns the Android UI team discussed at Google I/O. In the same vein, two problems that currently plague Android user interfaces are small tap targets and overly small font sizes. These are generally easy to fix and can make a big impact. As a general rule, optimize for ease of use and legibility, while minimizing, or at least carefully balancing, information density. Another way to incrementally improve usability, based on real-world data, is to implement Analytics throughout your app to log usage of particular sections. Consider demoting infrequently used sections to the options menu, or removing them altogether. For oftenly-used sections and UI elements, make sure they’re immediately obvious and easily accessible in your app’s UI so that users can get to them quickly. Lastly, usability is an extensive and well-documented subject, with close ties to interface design, cognitive science, and other disciplines. If you’re looking for a crash-course, start with Donald Norman’s The Design of Everyday Things. There’s no substitute for a real user interface designer — ideally one who’s well-versed in mobile and Android, and ideally handy with both interaction and visual design. One popular venue to post openings for designers is jobs.smashingmagazine.com, and leveraging social connections on Twitter and LinkedIn can surface great talent. If you don’t have the luxury of working with a UI designer, there are some ways in which you can improve your app’s appearance yourself. First, get familiar with Adobe Photoshop, Adobe Fireworks, or some other raster image editing tool. Mastering the art of the pixel in these apps takes time, but honing this skill can help build polish across your interface designs. Also, master the resources framework by studying the framework UI assets and layouts and reading through the new resources documentation. Techniques such as 9-patches and resource directory qualifiers are somewhat unique to Android, and are crucial in building flexible yet aesthetic UIs. The recently-published Android UI Design Tips slide deck contains a few more best practices for your consideration. Having the right set of features in your app is important. It’s often easy to fall into the trap of feature-creep, building as much functionality into your app as possible. Providing instant gratification by immediately showing the most important or relevant information is crucial on mobile devices. Providing too much information can be as frustrating (or even more so) than not providing enough of it. And again, listen to your users by collecting and responding to feature requests. Be careful, though, to take feature requests with grains of salt. Requests can be very useful in aggregate, to get a sense of what kinds of functionality you should be working on, but not every feature request needs to be implemented. A great way to deliver a delight user experience is to integrate tightly with the operating system. Features like app widgets, live folders, global search integration, and Quick Contacts badges are fairly low-hanging fruit in this regard. For some app categories, basic features like app widgets are par for the course. Not including them is a sure-fire way to tarnish an otherwise positive user experience. Some apps can achieve even tighter OS integration with the new contacts, accounts and sync APIs available in Android 2.0 and later. A few sample apps that show how to use these APIs are SampleSyncAdapter (bundled with the SDK samples) and JumpNote. Third-party integrations can provide even more user delight and give the user a feeling of device cohesiveness. It’s also a really nice way of adding functionality to your app without writing any extra code (by leveraging other apps’ functionalities). For example, if you’re creating a camera app, you can allow users to edit their photos in Photoshop Express before saving them to their collection, if they have that third-party application installed. More information on this subject is available in the Can I Use this Intent? article. One particular detail I’ll call out is in icon quality and consistency. Make sure your app icons (especially your launcher icon) are crisp and pixel-perfect at all resolutions, and follow the icon guidelines, at least in spirit if not in letter. If you’re having trouble or don’t have the resources to design the icons yourself, consider using the new Android Asset Studio tool (a project I’ve recently open-sourced) to generate a set. Along with this blog, make sure to follow @AndroidDev on Twitter — we’re constantly collecting and sharing tips and tricks on Android application development that you won’t always find anywhere else. And of course, don’t be afraid to ask questions in our support forums on Stack Overflow and Google Groups.